Light is an element of life, a major environmental factor in human development. It plays a significant role in how we process sensory information, impacting our visual experience from the point of birth and throughout our lives. 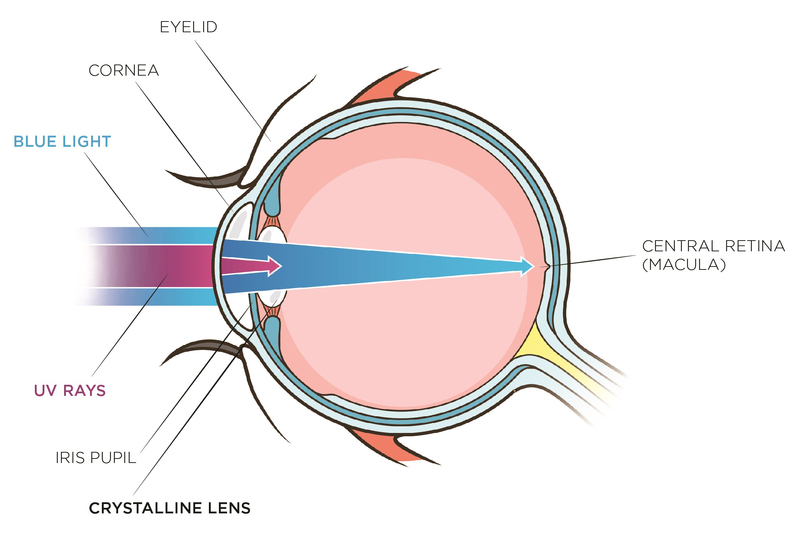 Visual perception occurs when light strikes the retina of the eye. The pupil of the iris serves as the optical diaphragm of the eye affecting the path of light rays which are refracted by the cornea and the crystalline lens on their way to the retina. Numerous deprivation experiments have demonstrated that ocular growth and refraction development are regulated by visual information. Light is essential in providing this information on diurnal species by transmitting signals which are converted by the brain into visual perception. This acquisition of visual function is experienced as early as infancy and is essential to healthy development. The iris acts as a natural optical diaphragm for expanding (dilation) or retracting (constriction) its central aperture. Depending essentially on lighting conditions and age, the diameter of the pupil ranges from 2mm to 8mm. Variations in the diameter of the pupil are caused by a movement reflex that regulates the light flux incident and, subsequently, visual performance. The visual system as a whole is sensitive over a wide range of light levels from starlight to bright sunlight but, despite the regulation of the pupil aperture, it cannot operate over the entire range simultaneously. An adaptation is required to adjust the light sensitivity of the visual system to different light levels. When the adaptation is in progress, visual performance is reduced. Once the process is complete, visual capabilities depend on the new level of light. Table 1. Summary of main lighting conditions (Boyce, 2001). The sun emits a tremendous amount of energy in the form of wide electromagnetic radiation. From cosmic rays to radio waves (Fig. 1), the majority of solar emissions are not visible to human photoreceptors. Only a thin portion – at wavelengths (λ) between 380nm and 780nm – provides the visible light that interacts with the eye’s photoreceptors – enabling us to see the world. When visible solar radiation reaches the Earth’s surface it is scattered throughout the atmosphere, especially in the blue-violet region corresponding to the shortest wavelengths (380-460nm) of visible light and subsequently to the highest energy. Beyond the visible spectrum, sunlight emits ultraviolet radiation with wavelengths shorter than 380nm – commonly referred to as UV – and infrared radiations with wavelengths greater than 780nm. Ultraviolet radiation arriving on earth surface is divided into UVB (280-315nm) and UVA (315-380nm). At sea level, about 10 percent of radiation is UV, 50 percent is visible and 40 percent is infrared. The blue sky is evidence that blue light is present in direct sunlight. 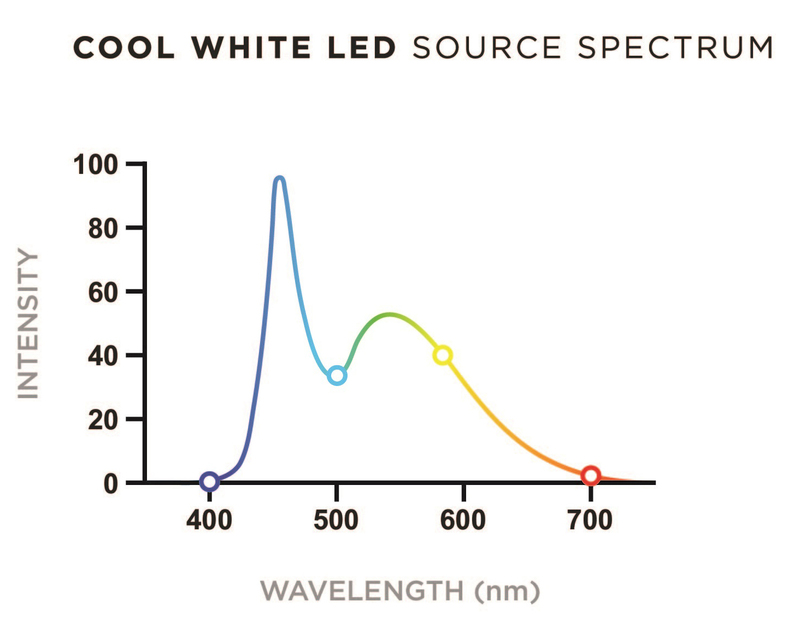 Since blue light is higher in energy than other wavelengths in the visible spectrum (Fig. 2), it scatters more throughout the atmosphere (Rayleigh scattering) and makes the sky appear blue. Blue light makes up 25-30 percent of daylight. While blue light is emitted naturally by the sun, it can also be produced by numerous artificial light sources commonly found indoors. Light-emitting diodes (LEDs) are gaining an increased share of the domestic lighting market because of their high efficiency of luminance and low energy consumption. 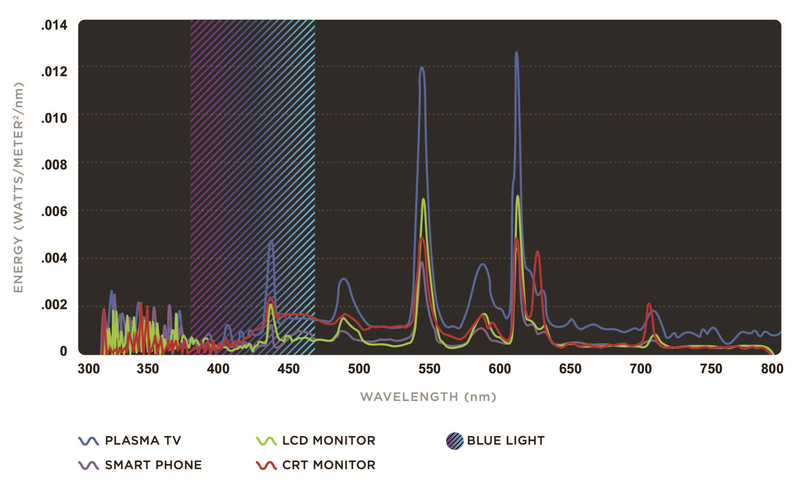 Widely found in digital screen technologies and displays, LEDs exhibit a high emission blue peak, centered at 430nm (Fig. 3). Amount of blue violet light is characterized by the intensity of emitted light of varied sources (Table 2). 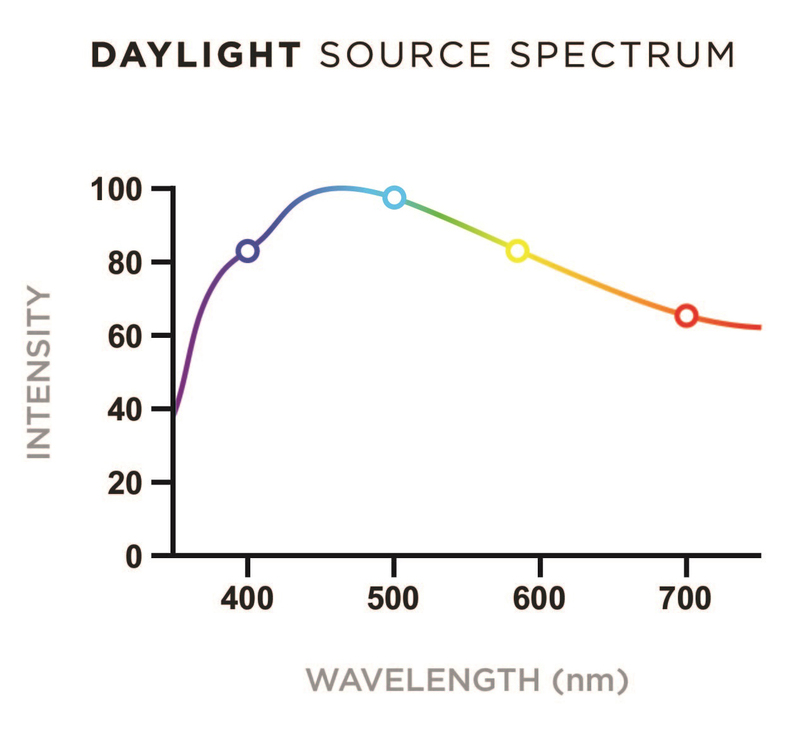 Sunlight is by far the strongest source of blue light at least 100 times greater than artificial sources (Fig. 4). The impact of blue-violet light exposure depends on the amount of total light reaching the retina: the retinal irradiance, which is characterized by the radiant flux (power) received by the retina per unit area. These values vary by the ocular media transmittance and – more importantly – by physical factors such as the eyelid position, which dictates the field of vision and the pupillary aperture, making ocular dosimetry far more complex than generally appreciated (Sliney 2001, 2005). [12, 13] More investigations need to be done, but it seems reasonable to think that the level of retinal irradiance in the 435+/- 20 nm range is more important outdoors than indoors. Wearing appropriate glasses can be worthwhile to prevent from cumulative effects of light exposure. With the potential risks associated with outdoor conditions described and the natural protections of the human eye discussed, we now turn our attention to the technical solutions available within the eyewear industry to prevent from the long-term effects of blue-violet light. UV protection in eyewear will not be reviewed here since most high-quality lenses today offer complete protection against UV up to 380nm. Anti-reflective interferential layers may be applied to ophthalmic lenses by evaporating transparent dielectric metal oxides to the anti-scratch coating on both the convex and concave sides of the lens. The coatings essentially involve stacks created by successive deposits. Processed under vacuum on a few hundred nanometers of low index material (RI ~1.46) and high index material (RI ~ 2.2) of desired thickness (Fig. 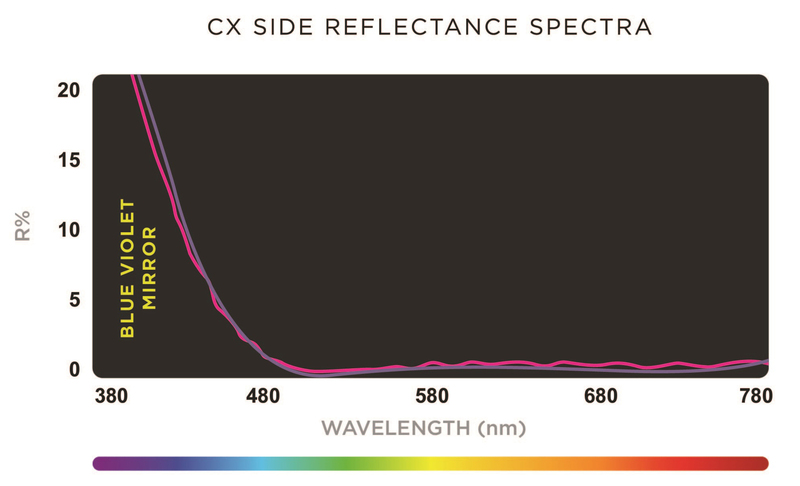 6), they provide anti-reflective properties within the visible region of the light spectrum. It is possible to design anti-reflective stacks that offer enhanced protection in the blue-violet light region by adding a specific reflection element at the wavelength to be rejected, in this case 380-460nm. The blue-filtering reflective properties can be effective up to 20 percent while keeping superior anti-reflective properties active within the entire remaining visible range. These ophthalmic lenses display high clarity indoors and outdoors, and offer reliable indoor protection against harmful blue-violet light emitted by electronic devices and artificial lighting while providing moderate outdoor protection as well. Another way to prevent harmful blue-violet light from entering the eye is to reduce the unwanted wavelengths by absorbing them with yellow dye, a chemical compound whose structure allows absorption in the visible part of the light spectrum of its complementary color: in this case, blue. This is why most blue-absorbing lenses appear more or less yellow depending on the level of their blue-filtering properties. A highly-efficient blue-blocking lens would appear deep yellow, while a moderately efficient blue-blocking lens would appear merely yellowish. The advantage of the yellow dye solution is that it can reduce a significant amount of blue light, but the intense yellow color is detrimental to its cosmetic appearance and detracts from human color perception. A highly intense yellow filter, for example, will induce color distortion despite the ability of the brain to adapt chromatically. There is a way to circumvent the yellow color of an absorbing filter that involves “color balancing” the tint by adding a small proportion of another dye. The complementary dye absorbs in another region of the visible spectrum, creating a global neutral grey filter (Fig. 7). This solution is acceptable for low yellow colors – where color balancing can be efficient – but not possible for dark yellow tones. It should be noted as well that color balancing in general is detrimental to the global photopic transmission of a lens since it causes a loss of visible transmission (or clarity). A lens can also be surface tinted by dipping an uncoated lens substrate or a tintable coated lens in a water dye solution at an elevated temperature. Another solution is to cast lenses with monomers that already contain yellow dyes – and its color balancing agents – in the original formulation. In this case, only light tints are achievable since darker tints would lead to a non-homogeneous appearance from center to edge due to differences in prescription lens thickness (high-minus and high-plus finished lenses). Sunwear lenses are commonly grouped by IS0 8983-3 standards as class 3, providing 10-15% of photopic transmission (Tv), or the darker class 4 category (Tv < 8%). In the case of prescription eyewear, sun lenses are essentially made by diffusing a mixture of dyes in a polymer substrate or in a tintable coating. For the plano sunwear business, coloring is achieved by mass mixing an injection mold of polycarbonate for instance. Polarized lenses are made by using dichroic dyes in pre-formed stretched films or encapsulated wafers. The dyes are generally a mixture of primary colors in different combinations to achieve the desired hues based on the principle of subtractive color mixing (Baillet et al., 2008). The most common hues are brown and grey. 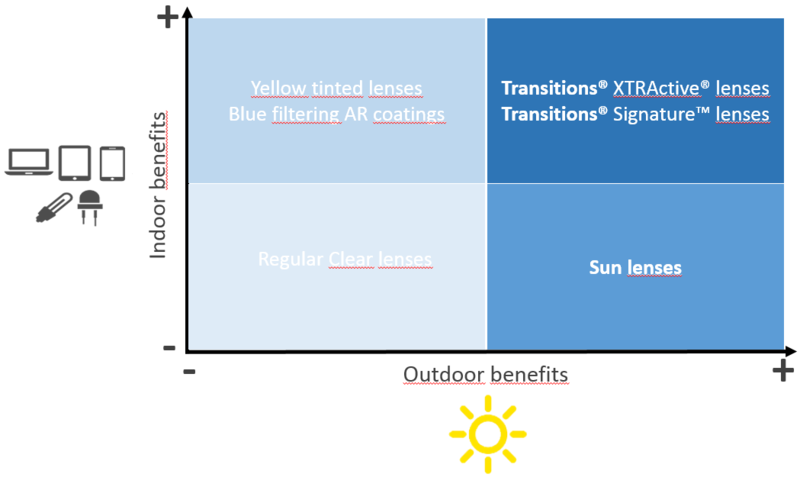 In the fashion and high-performance sunwear business, one finds mirrored lenses manufactured on the principle of interferential light rejection stacks and/or a mix of tinting by absorption and rejection mirror technologies. By definition and usage, sun lenses are made exclusively for outdoor purposes. 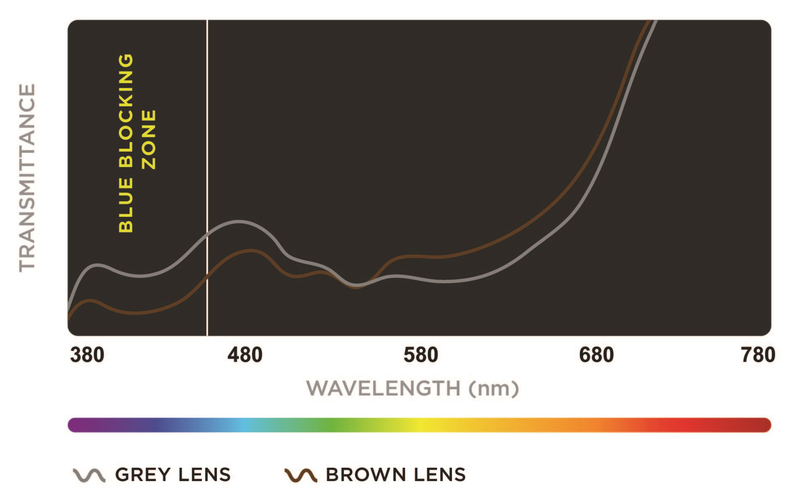 The dark intensity of the lenses, both plano and Rx, allows very good protection against blue light, especially by brown lenses where the yellow dye content in the mixture is in the majority (Fig. 8). Photochromic lenses are non-permanent tinted filters containing photochromic dyes made from molecular structures that are reversible under the action of light (DÜrr et al., 1990). Their tint or color is obtained through the same principle of color-subtractive mixing as sunwear lenses. There are, however, several notable differences in manufacturing technologies, including the cast in place (CIP) process wherein photochromic dyes are added to the monomers before polymerization, and the imbibition process, where photochromic dyes are absorbed into the surface of a lens. In these first two examples, a dedicated polymer allows the photochromic mechanism and movements to occur, and requires different polymers for each refractive index (for prescription lenses). The coating technology, meanwhile, wherein photochromic dyes are added to a coating deposited by dip – or preferentially, by spin – allows the process to be substrate independent. Photochromic lenses are highly efficient in protecting against glare, since their darkness (photopic transmission) automatically adjusts to the amount of outdoor light, whether overcast, in shadow or in bright sunlight. Because they always acclimate to various lighting levels, they help the visual system to adapt instantaneously without compromising visual performance or comfort. 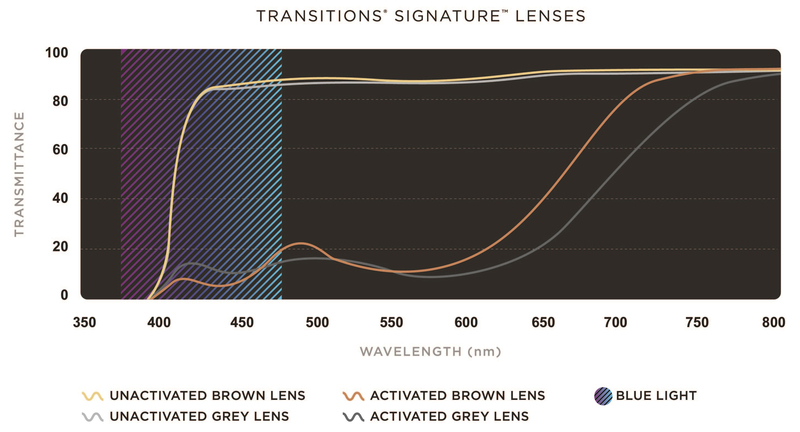 The advantage of photochromic lenses like Transitions® Signature™ lenses is that they are dark outside when sunlight is bright and intense, so they offer a high level of blue light filtering much like regular sun lenses. They can be worn all the times and offer good indoor protection against artificial blue lights with no aesthetic drawbacks such as residual yellow color (Fig. 9). As described before, color-balancing can help to limit the yellowish aspect of a given filter. For photochromic lenses, where a very low level of yellowness needs to be overcome, the smart color balancing is put to full use. Only a slight amount of dyes are used to deceive the eye (and subsequently the brain) to offset the yellowish aspect induced by chemical species providing the blue blocking properties. 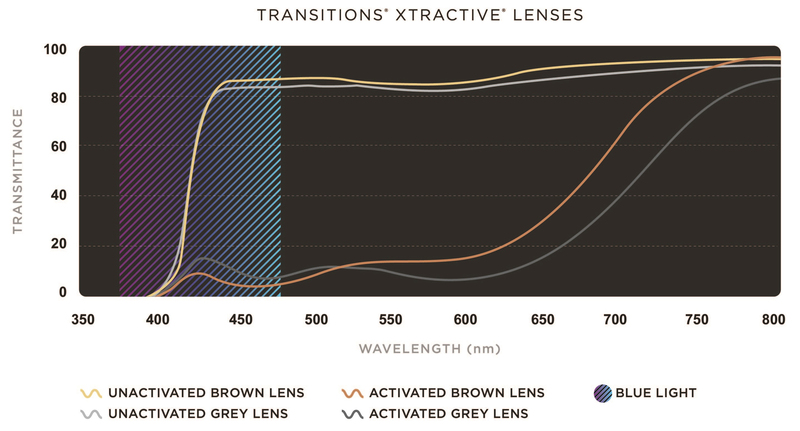 A specific family of high technology products like Transitions® XTRActive® lenses, which allow activation of the photochromic molecules behind the windshield of a vehicle, present the unique advantage of having a light tint indoor and a strong tint outdoor, leading to enhanced blue light-filtering at all times (Fig. 9 and 10) thanks to specific proprietary photochromic molecules that intrinsically absorb in the blue region of the visible spectrum. Visible light reaching the retina is essential for visual perception. Despite several self-protection mechanisms, the retina in the human eye can be exposed to light levels that exceed its natural defenses and can cause long-term irreversible damage. The lifelong buildup of light-induced phototoxicity can contribute to age-related changes and retinal cell degeneration. Preventing excess exposure and accumulation of blue-violet light indoors – and especially outdoors – during one’s life seems like common sense. 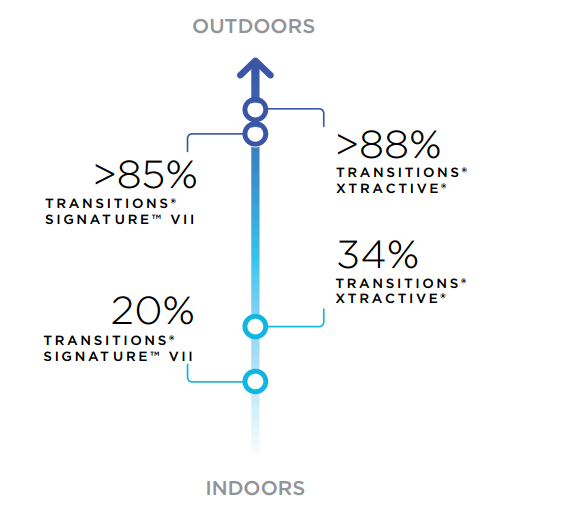 Transitions® photochromic lenses – and, in particular, Transitions® XTRActive® lenses – offer the optimum visual experience, regardless of lighting conditions, while providing an ideal protection against blue-violet light under all circumstances (Fig. 11). 06. Boyce P.R., International Encyclopedia of Ergonomics and Human Factors. Ed. Karwowski W., 2 (2011) 1016-1021.